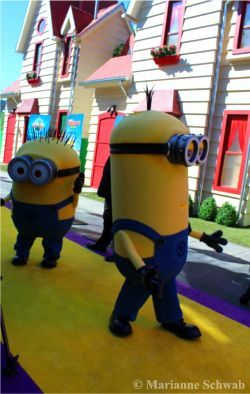 The new "Despicable Me Minion Mayhem" ride at Universal Studios Hollywood is officially open and guaranteed to bring out the kid in everyone. I have to confess, I was actually giddy with excitement the night before attending the official opening of the new ride. As a Southern California resident, I visit this theme park several times a year and love how Universal Studios Hollywood continues to evolve and showcase the latest Hollywood blockbusters, turning them into an entertaining ride experience that makes you part of the movie. 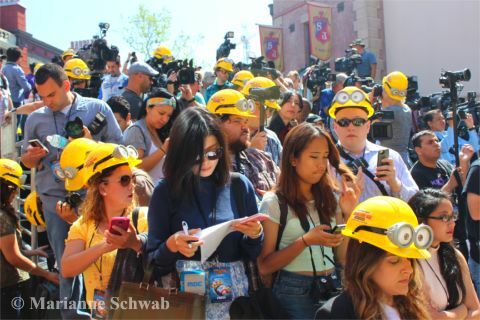 The yellow carpet, not red carpet, in the spirit of Minion Mayhem, was packed with paparazzi donning Minion hardhats as we were all deputized as Minions for a day. 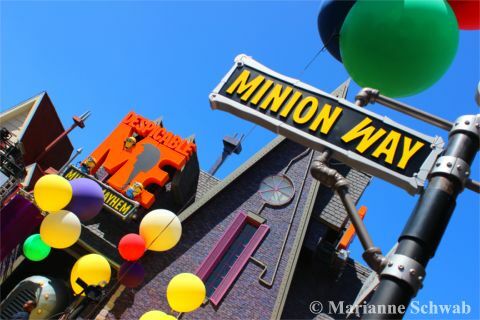 This totally fits the theme of the "Despicable Me Minion Mayhem" ride where, if you dare, you will enter Gru's living room and you WILL be turned you into one of his Minions. 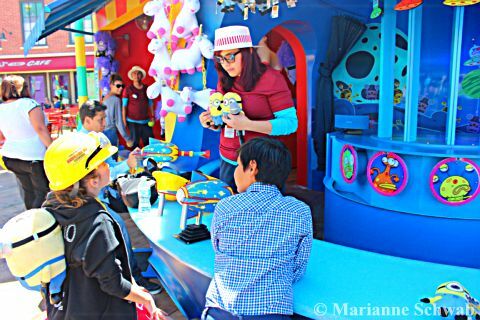 Since this was a major Hollywood event, there were lots of celebrities on hand to participate in the fun and excitement including the star voices of Gru's girls Miranda Cosgrove (Margo), Dana Gaier (Edith), and Elsie Fisher (Agnes), who were an integral part of the opening ceremony. 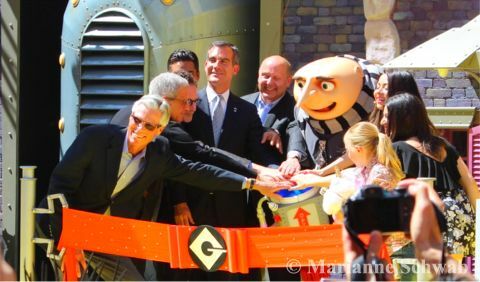 They were joined by Gru, of course, who couldn't settle for a simple ribbon-cutting, but had to make sure it was an event involving a very big explosion. So the girls along with Gru, Extra's Mario Lopez, Los Angeles Mayor Eric Garcetti, and several Universal Studios Hollywood executives, all had their hands on the detonator to officially open the ride and then with a big Ka-Boom, the ceremonial ribbon was torn open and the crowd was sprayed with yellow balloons and yellow confetti. 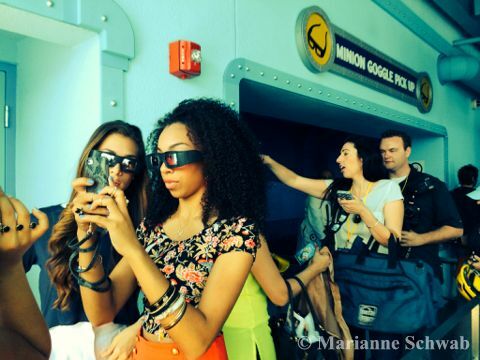 Everyone was eager to then experience the "Despicable Me Minion Mayhem" ride. After picking up my specially designed 3-D Minion Goggles along with X-Factor's Sweet Surprise (who couldn't resist taking a selfie in their goggles), I started my journey into Gru's living room and encountered the many memorable artifacts from the "Despicable Me" movies, including his notorious SR6 Shrink Ray and rhinoceros chair, before making my way into his super–villain laboratory where we were given brief safety instructions in a video featuring Gru, himself. Among those instructions - "If your number of eyes do not match the number of lenses on your goggles, then please tell a lab assistant." Also, "In the event of a water landing, your goggles will turn into a flotation device." Now, those are cool goggles! So once inside the laboratory, Gru was ready to turn us ordinary boring civilians (and a few celebs like Sweet Surprise) into Minions and begin our journey through a humorous Minion training mission. 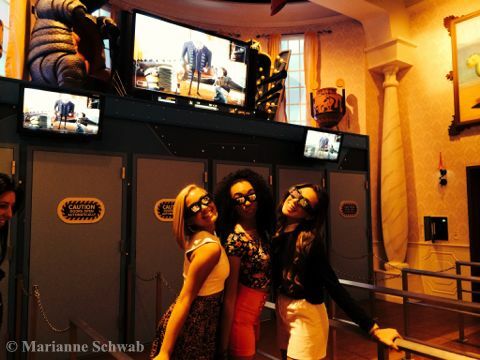 Hey, being turned into a Minion via this 3-D experience was quite an extraordinary experience that had me giggling through all sorts of obstacles that, as an ordinary boring civilian, might have been quite frightening. But luckily for me, and everyone else on the ride, the Minion transformation failed and we were able to return to our human existence, much to Gru's disappointment. A post-show Minion party with the feel good song, "Happy," will have you leaving the ride dancing and grinning ear to ear as you...exit into the gift shop, of course. 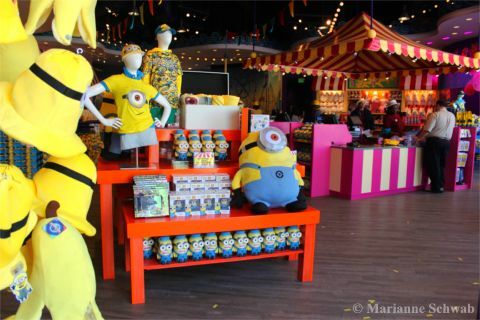 After purchasing your Minion memorabilia (I couldn't resist a Minion nightshirt), you'll enter "Super Silly Fun Land" with an elaborate carnival setting and play zone unique to Universal Studios Hollywood and inspired by Gru's seaside visit with the girls where he "won" Agnes the iconic fluffy unicorn. 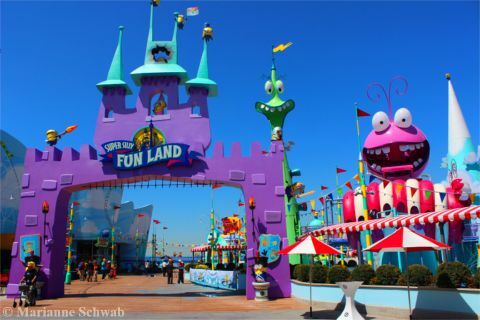 You'll have the chance to win a unicorn of your own, ride the "Silly Swirly" and roam the boardwalk of this uniquely stylized environment, which until now, could only be enjoyed on the big screen. Since this will be hot attraction for quite some time, I advise that you get to the park when it opens and head straight to "Despicable Me Minion Mayhem" at the corner of Baker Street and Minion Way so you will not get stuck with a long wait time. 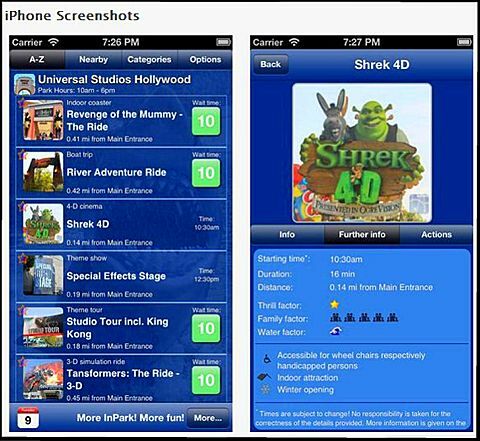 As soon as you experience this part of Universal Studios Hollywood, head down to the lower park since wait times for rides like Transformers: The Ride will be shorter earlier in the day, but you can have that information at your fingertips via your smart phone with the Universal Studios Hollywood InPark Assistant App for up-to-date wait times on rides and more. Remember, if you're a Southern California resident, be sure to take advantage of the buy one day and get the whole year for free with the Annual Pass. 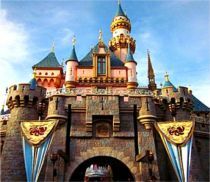 If you're visiting Los Angeles and want to get a better bang for your buck on local attractions, then you'll want to look into the Go City Card where you can save up to 55% on theme parks and more.